A San Luis Obispo man chased after and tackled a burglar who broke into his home and stole belongings early Tuesday morning. The resident held down the burglar long enough for police to arrive and arrest the suspect. Around 3:50 a.m., San Luis Obispo police received a report about a male yelling for help in the 2000 block of Rachel Street. Officers arrived at the scene and found one man physically detaining another. Police separated the men and quickly discovered it was a burglary victim detaining a suspected burglar. The victim told police he was sleeping inside his home when he heard a noise coming from another room. When the man went to investigate, he found 25-year-old Dustin Leek of Templeton standing in his living room. Leek fled the home, but the the victim caught up with him and detained him until officers arrived. Police found Leek was in possession of several items belonging to the victim. Officers arrested Leek for first degree burglary and violating probation. 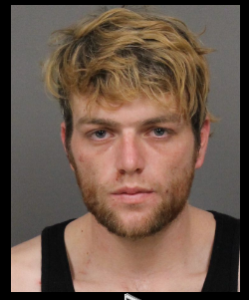 Police booked Leak into the San Luis Obispo County Jail, where he currently remains with his bail set at $65,000. San Luis Obispo police are reminding residents to keep their doors and windows locked to stop would-be thieves and burglars from gaining easy and quiet access to homes. Police also recommend installing motion sensitive lighting near doors and windows as a proven way to deter criminals. “… first degree burglary and violating probation…” Obviously, not his first time down this road. Must be one of those nice “young” kids that our politicians don’t want to sentence to jail or prison because it might ruin their future! The problem is they weren’t held accountable on the first offense. Where are the parents of these lovely precious children? It is any wonder our society is so full of loser’s. druggie’s and criminals of all types. Keep protesting about your rights and how abused the police are to you! Meth, natures way of weeding out the unfit. Unfortunately the unfit have a way of impacting the lives of the “fit”. Hopefully the homeowner ground his face into the pavement until the cops arrived.